The Great One pinged and told us that Chef Francky Semblat was leaving Robuchon au Dôme - after serving as its executive chef since the restaurant's opening in 2001 - and she wanted to a final meal there before Francky's departure. Today seemed to be an agreeable date, but we were a little late in planning this meal. So, being the thick-skinned person that I am, I asked the PR team at Hotel Lisboa to see if they could help us secure a table. Thankfully they were able to put us in one of the private rooms when a customer chose not to confirm. The first order of business at any meal here is... butter. More specifically, Bordier butter. The butter trolley gets wheeled in, bearing two huge mounds of my favorite French butter, as the staff asks whether we would prefer the unsalted or salted variety. The Great One put her foot down and chose the salted butter for everyone because... why would any rational person choose the unsalted version? The attending staff dutifully used two large dinner spoons to scrape several "ribbon" of butter from the mound and placed them on serving dishes... Don't these look just absolutely beautiful?? As the bread trolley is loaded way too high to fit through the doorway to our private room, the staff decided to choose a rather large selection for us. As much as I didn't want to take up precious stomach space with bread, I can never resist... not just because the bread is delicious, but because I need to have some bread with that butter! La cerise : cherry gazpacho with frozen ricotta and pistachio flakes - our amuse bouche was similar to something I've had here a number of years ago. The "regular" gazpacho was modified to include black cherries. With the frozen ricotta sprinkled on top, this introduced some creaminess to neutralize some of the acidity. We were all a little surprised when this showed up, because it didn't look like anything we had ordered. As it turns out, this was a complimentary course from the kitchen, and it was basically the same starter I had on my very first visit to Robuchon a Galera back in 2005... back when a 3-course lunch cost less than MOP 300 and the restaurant was mostly empty! This was a deep-fried New Zealand scampi with basil oil dip. The langoustine was perfectly succulent, and there was a basil leaf hidden beneath the wrapper. The basil oil was very, very fragrant and delicious. L'hamachi : yellowtail carpaccio, duo of beetroot and apple refreshed with a green mustard sorbet - an absolutely beautiful dish, both in terms of flavors and presentation. The yellowtail carpaccio had beautiful texture, and wonderfully seasoned with finely chopped chives and what looked to be piment d'espelette. The beetroot salad did not have the characteristic earthy flavors that I find objectionable, thanks to the green apple, avocado, and herbs such as dill. The bit that amazed everyone ordering this dish? That quenelle of green mustard sorbet on top of the herbs. Wow! Le champignon: mushroom bouillon, foie gras royale and celery - the cone of foie gras royale was surrounded by tiny little mushrooms and topped with julienned celery as well as pieces of crispy country bacon. With the soup in the bowl, the rich flavors and fragrance of mushrooms slowly filled my nostrils. Not surprisingly the seasoning was not on the light side, but that's to be expected for this season. Little mushrooms have been "printed" on the edge of the bowl using silver powder. Very cute. I was worried that the prawn looked a little overdone, but who am I to question the execution of a 3-star restaurant?! The prawn was perfectly fine. L'agneau : rump of lamb roasted with spices, confit aubergines rolled with romesco sauce - surprisingly, the lamb came a little lukewarm, but the execution was perfectly fine. The lamb itself was also very lamby. The aubergine and herb salad was pretty nice. And even though I was pretty full by now, I did get a little dollop of that unbeatable, world famous pomme purée. 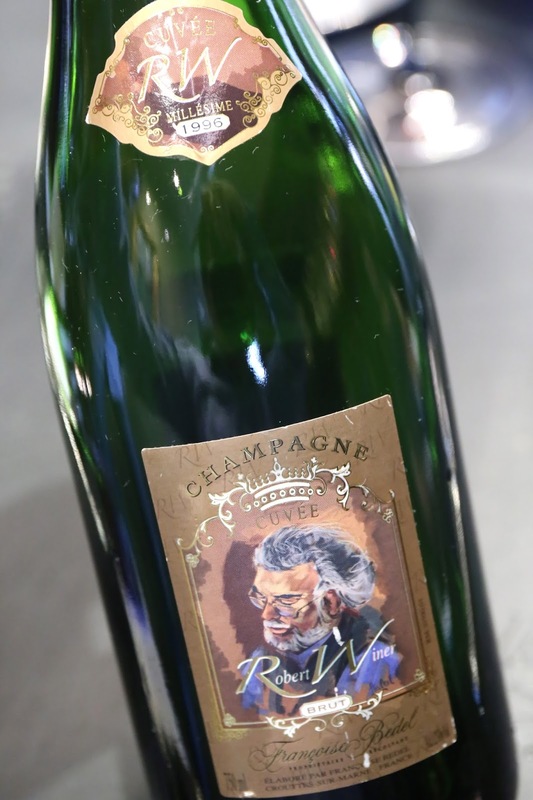 1996 Françoise Bedel Cuvée Robert Winer - nose was a little yeasty, nice and a little caramelized, but still pretty fresh. Medium acidity on the palate and very, very well balanced. Such an enjoyable wine to drink! 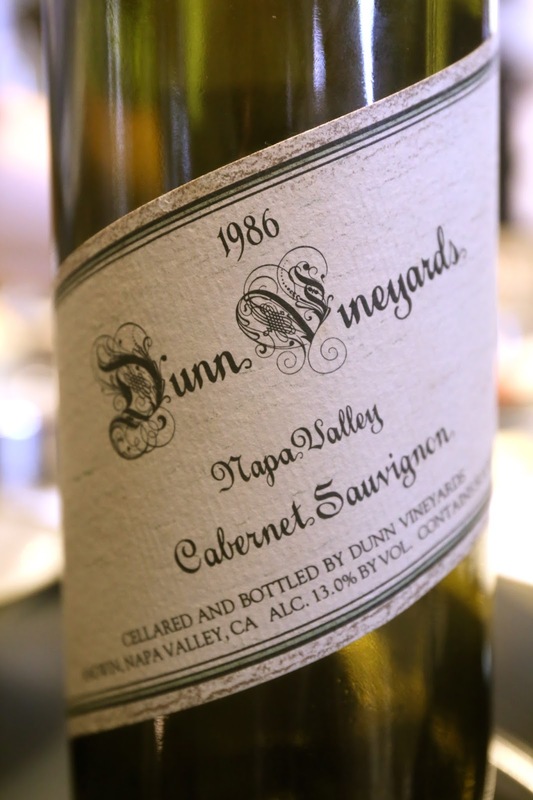 1986 Dunn Napa Valley - opened for 1½ hours and decanted prior to serving. Nose was initially a little stinky, with animal, leather, mint, and some sweet fruit. Still plenty of tannins after almost 30 years, but there's also plenty of acidity here to keep it going. First, the plate of "milder" cheese, featuring a 3-year Comté, 3-year Morbier, Reblochon, Chevrotin des Aravis, and Signal. Morbier, 3-years - interesting how this is made as a by-product of Comté production, with the same milk, but the texture is completely different. So soft and springy. Chevrotin des Aravis - salty, very strong and pungent. Then the plate of "stronger (read: stinkier)" cheese, featuring Maroilles, Époisses, Roquefort, Fourme d'Ambert, and Bleu d'Auvergne. Maroilles - kinda similar to Munster. Pretty salty, definitely very stinky, and more dense in texture. St. Honoré - very yum. Millefeuille - nibbled on a little bit of this. Can't beat this. 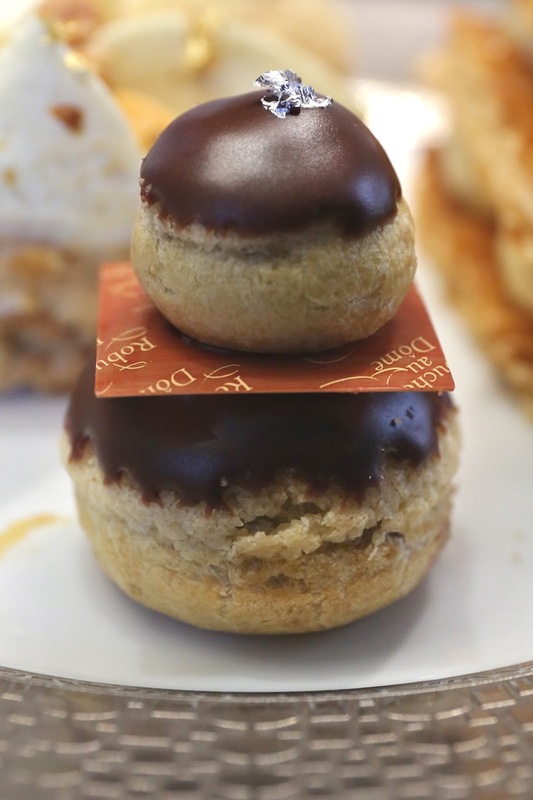 Religieuse - this version was filled with chocolate mousse inside. Île flottante - very light of fluffy, of course... and sitting in a pool of chocolate cream instead of the usual crème anglaise. We skipped the ice cream trolley, so the final trolley coming in was the mignardises trolley. Hazelnut madeleine - these came fresh and warm from the kitchen, and they were so delicious even the Great One proclaimed that they were the lightest and fluffiest she's had... and she publishes recipes on madeleines! I picked a few to nibble on, but only managed to have the delicious canelé and the caramel chocolate. The caramels and nougats were taken by my friends to their kids at home. It was finally time to have my obligatory cup of coffee. Not that the coffee here isn't any good, but the real reason for having coffee is so that we could have the amazing caramel sauce... This used to be the most amazing caramel sauce I've ever tasted, because once upon a time it used to be made with Louis XIII de Remy Martin... We were told today that it's now made with V.S.O.P., which seems much more reasonable to me than a bottle of Cognac that cost USD 2,000 a bottle... Oh yes, it was still delicious, and I still kept spooning it directly into my mouth. No need to adulterate it with coffee at all. Stuffed almost to the point of bursting. I felt like a python who had just swallowed a small farm animal and now had to go off and hide while I digest my food for the next few weeks. It was, as one of my friends said, a perfect way to spend Sunday. We'll be back, and hopefully sooner rather than later. Such a delicious selection. They do have a nice array of cheese and pastries.